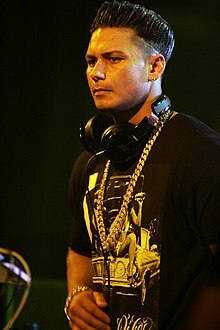 Paul D. DelVecchio Jr. (born July 5, 1980), publicly known as DJ Pauly D, is an American television personality and disc jockey. He is best known for being a housemate on MTV's reality show Jersey Shore. In August 2011, he announced a pending three-album deal with 50 Cent's G-Unit Records and G-Note Records. This deal was later confirmed by 50 Cent on December 1, 2011. He is also the first of the Jersey Shore cast to get his own spin-off show, The Pauly D Project. DelVecchio was born on July 5, 1980, in Providence, Rhode Island. He is the son of Donna DiCarlo and Paul D. DelVecchio Sr. He has said that he is of "100% Italian" descent. He has one sister, Vanessa. He began his career as a local DJ under the moniker Pauly D. One of his professional idols was DJ AM. DelVecchio was cast in 2009 for Jersey Shore. He has stated that his being chosen for Jersey Shore had nothing to do with his music, but that they instead sent him a Myspace message after liking his look. After he sent them his number, "The casting directors called me from LA and they said they wanted to send down a camera crew to Rhode Island to film a day in my life. They filmed me at the gym, filmed me tanning and filmed me going to the club. Six months later they said I got on the show. I never really auditioned." His appearance in the show resulted in popularity with what TIME dubbed "seriously rabid fans." He won the 2011 Teen Choice Award for Choice Reality Star: Male. He was a contestant in June 2012 on the Fox show called The Choice. DelVecchio is the first housemate from Jersey Shore to receive his own spin-off. The show focused on his DJ career as he goes on a tour around America. Filming commenced in 2012. According to TIME, "We're guessing Pauly D got the spot [instead of Nicole Polizzi or Michael Sorrentino] because he genuinely seems fun and easy to get along with. He's not known for diva antics like The Situation and doesn't appear a drunken mess at times, like Nicole and Michael do." The show, originally called DelVecchio was later renamed The Pauly D Project. It premiered on MTV on March 29, 2012. In 2018, DelVecchio rejoined the Jersey Shore castmates for a sequel series, Jersey Shore: Family Vacation set in Miami. In 2010, DelVecchio released a single, "Beat Dat Beat (It's Time To)". He was also nominated for the "America's Best DJ" competition in 2010 and 2011. After numerous rumors, on August 11, 2011, Pauly D confirmed to XXL that he had signed a three-album deal with 50 Cent's labels G-Unit Records & G-Note Records and that he will also be releasing headphones under the label. In 2011, DelVecchio announced that he would open for Britney Spears on her Femme Fatale Tour in North America in selected cities. In August 2012, Wrestling Inc. reported that Pauly D would be the social media ambassador for SummerSlam. Pauly D released his first single of debut album, called "Back to Love", on January 15, 2012, featuring British singer Jay Sean. In 2016, DJ Pauly D released a single called "Did You Know" with Tdot illdude. In 2016, Pauly D joined the cast of Famously Single on the E! network. The show follows eight single celebrities who move in together to examine their romantic problems. In October 2013, he announced that he was the father of a daughter, Amabella Sophia, born in New Jersey. ^ a b c "Pauly Delvecchio [sic]". TVGuide.com. Archived from the original on July 24, 2015. ^ Everett, Cristina (21 December 2009). "'Jersey Shore' star DJ Pauly D (Paul Delvecchio) shows News how he takes hair to new heights". Daily News. New York. Retrieved 6 July 2011. ^ a b "San Francisco Night Club Ruby Skye to host DJ Pauly D of Jersey Shore Fame". Hearst Communications. 11 February 2011. Retrieved 6 July 2011. ^ Keys, Matthew. ""Jersey Shore" Reality Star DJ Pauly D Spotted In Sacramento". FOX40 News. Retrieved 6 July 2011. ^ Malkin, Marc. "Jersey Shore's Pauly D: I'd Get Naked for Playgirl". E!. Retrieved 6 July 2011. ^ "Pauly D Confirms G-Unit Deal With 50 Cent". www.thisis50.com. Retrieved 2016-06-16. ^ "DJ Pauly D Officially Signs with 50 Cent's G-Note/G-Unit Records". www.thisis50.com. Retrieved 2016-06-16. ^ a b "Pauly D's 'Jersey Shore' Spin-Off To Premiere March 29". MTV News. Retrieved 2016-06-16. ^ "Bio". DJ Pauly D official website. Archived from the original on April 1, 2011. ^ "Jersey Shore's Pauly D Live Q&A Pt. 6: His book, club, Being Italian". Billboard. Retrieved 2016-06-16. ^ "Pauly Delvecchio". TVGuide.com. Retrieved 2016-06-16. ^ a b Kugel, Allison (September 8, 2011). "DJ Pauly D Opens Up About Jersey Shore Fame & Fortune". PR.com. Retrieved 2011-10-11. ^ a b c Friedman, Megan (27 December 2010). "Why Did Pauly D Get Jersey Shore's First Spinoff Show?". TIME. Retrieved 6 July 2011. ^ Vena, Jocelyn (May 9, 2012). "Joe Jonas, Pauly D To Appear On Dating Show 'The Choice'". MTV. Retrieved April 11, 2013. ^ "Pauly D gets first 'Shore' spinoff". NEW YORK POST. December 22, 2010. Retrieved 6 July 2011. ^ "America's Best DJ - 2010". Retrieved 26 February 2013. ^ "America's Best DJ - 2011". Retrieved 26 February 2013. ^ "DJ Pauly D Signs Deal With G-Unit | HipHop-N-More". hiphop-n-more.com. Retrieved 2016-06-16. ^ Oldenburg, Ann (July 25, 2011). "'Jersey Shore' star to join Britney Spears on tour". USA Today. Gannett Company. Retrieved August 1, 2011. ^ "WWE SummerSlam To Feature DJ Pauly D of 'The Jersey Shore' And Chris Jericho". International Business Times. 2012-08-06. Retrieved 2016-06-16. ^ "Back to Love (feat. Jay Sean): DJ Pauly D: Official Music". Amazon.com. Amazon.com, Inc. Retrieved 12 January 2013. ^ Freydkin, Donna (22 June 2016). "You must read Pauly D's spot-on romantic advice". AOL. AOL News. Retrieved 11 August 2016. ^ "Pauly D joins Famously Single cast". Retrieved July 14, 2016. ^ "Aubrey O'Day & Pauly D". ^ Eby, Margaret. "Pauly D meets daughter Amabella for the first time: report - NY Daily News". ^ "Pauly D reveals he has a daughter". 22 October 2013. For "Back to Love": "New Chart Entries > January 26, 2013". Zobbel.de. 2013-01-26. This page was last edited on 28 January 2019, at 20:15 (UTC).